Between 2000 and 2016 the number of Canadians dying from mesothelioma increased from 292 deaths in 2000 to 510 in 2016 – an increase of 70 per cent. In total, according to the latest data from Statistics Canada, almost seven thousand Canadians died from mesothelioma during this period. These figures represent only a small fraction of the number of deaths caused by asbestos. In addition to mesothelioma, asbestos causes more than twice as many cases of lung and other cancers, as well as asbestosis. What is shocking and heartbreaking is that the number of new cases of mesothelioma also continues to rise. In the twenty years between 1992 and 2012, the number of new cases of mesothelioma in Canada doubled from 275 in 1992 to 560 in 2012. More than eight thousand Canadians were diagnosed with mesothelioma in this period. Canada’s asbestos catastrophe continues to grow. The data on new cases was downloaded from the Statistics Canada website by the author in 2015. Today this information is no longer available since Quebec has stopped providing any data on the number of new cases of mesothelioma in Quebec from 2010 onwards or on new cases of cancer in general. Consequently, Statistics Canada now only provides statistics on the number of new cases of mesothelioma for Canada minus Quebec from 2010 onward, making it impossible to track the number of new cases for Canada as a whole. For Canada minus Quebec the number of new cases of mesothelioma increased from 390 new cases in 2010 to 475 new cases in 2015, an increase of 20% in five years. In all, 2,570 individuals across Canada (exuding Quebec) were diagnosed with mesothelioma in that period. Canada is decades behind other western countries in banning asbestos. Until 2015, the previous Conservative government of Stephen Harper supported the mining, use and export of asbestos. The present Trudeau Liberal government is expected to introduce legislation to finally ban the use, import and export of asbestos by the end of 2018. 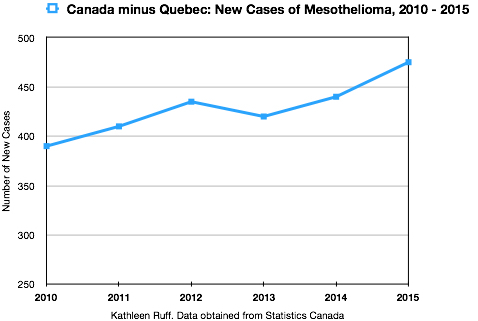 But the INSPQ confirms that it has no data on new cases of mesothelioma in Quebec since 2010. How can the INSPQ fulfill its mandate to “monitor asbestos exposures and related diseases” if the Ministry of Health and Social Services (MSSS) has ceased to provide the INSPQ or Statistics Canada with the necessary data? \clearly shows, only a small proportion of physicians fulfill this obligation and the data is consequently unreliable. 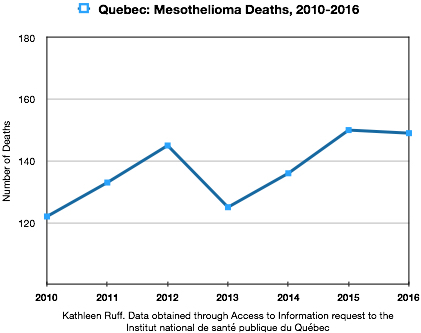 The INSPQ has, however, information on the number of deaths from mesothelioma in Quebec, which the author was able to obtain through an access to documents request. From 2010 to 2016 the number of deaths increased by 20% from 122 deaths in 2010 to 149 deaths in 2016. These figures, which do not represent the total number of deaths from mesothelioma, show that 960 Quebecers died because of asbestos during these six years. Each death represents enormous suffering for the individual and their family. The INSPQ falls under the jurisdiction of the Minister of Health. The government of Quebec appoints the members of its board of directors and a deputy-minister of Health sits on its board. The mandate of the INSPQ is to carry out research, publish reports and make recommendations to the Minister of Health to improve the state of health of the Quebec population. The INSPQ’s recommendations on asbestos did not, however, please the Minister of Health of the previous Liberal government of Quebec, Dr. Yves Bolduc, who rejected their recommendations and continued to support the mining and use of asbestos, claiming, contrary to all the evidence, that it could be safely used. The asbestos lobby in Quebec ferociously attacked the INSPQ’s scientists, calling them “a little gang of Taliban”. In 2011, fifty Quebec medical doctors and a hundred scientific experts from around the world submitted a complaint against Dr. Bolduc and the Quebec government to the Quebec College of Physicians (CMQ) for wilfully causing harm to health. In response, the College published a media release which recommended that anyone dealing with the asbestos issue should be guided by the INSPQ because it has the medical expertise and the legal mandate to provide the necessary advice. The former Minister of Health, Dr. Bolduc, rejected the College’s recommendation and continued supporting the use and export of asbestos. The current Minister of Health, Dr. Gaétan Barrette, who is a radiologist and former president of the Federation of Medical Specialists of Quebec, is likewise refusing to heed the recommendations of the INSPQ regarding asbestos. Quebec’s regulations permit workers to be exposed to ten times higher levels of chrysotile asbestos fibres (1 fibre/ml) than is permitted by other Canadian provinces, by the federal government, by the United States, or by European or other industrialized countries (0.1 fibre/cc) and is one hundred times higher than the levels permitted by France, Switzerland and the Netherlands (0.01 fibre/cc). The Quebec standard is the one promoted by the asbestos industry. It has been condemned as shameful and dangerous by scientific experts in Quebec and around the world. Since 2003, as documented in an article published in 2009 by Quebec’s largest newspaper La Presse, entitled Asbestos: Quebec has the weakest standard of any western country (translation), the INSPQ has made repeated calls to the government of Quebec to adopt a stricter asbestos exposure standard. Its calls have been disregarded. The Quebec Medical Association, the Quebec Public Health Association, the Quebec Association of Asbestos Victims, the Quebec Federation of Labour – Construction, the Quebec Cancer Society, the David Suzuki Foundation, the University of Montreal School of Public Health, the directors of Public Health from all around Quebec, as well as other organisations, sent a letter to the leaders of all four Quebec political parties in February 2018, imploring them to support the adoption of a stricter asbestos exposure standard. “How is it that our workers are 10 times more exposed than in Canada? This is unacceptable,” said FTQ-Construction General Manager, Yves Ouellet: “No one should have to expose themselves to a life-threatening illness just by going to work (translation)”. Has the government of Quebec adopted a strategy to try to “disappear” Quebec asbestos victims in order to hide the asbestos tragedy so that it can continue to expose workers to dangerous levels of asbestos? The Quebec Commission on occupations standards, equity, health and safety (CNESST), whose mandate is to protect workers, seems to be part of this strategy. In February 2018 the Commission still had not made a recommendation and said that it expected to publish its recommendation by the spring of 2018. On September 9, 2018, the author asked the CNESST – When will the CNESST make its decision on the asbestos exposure standard? The CNESST responded: “the advisory committee is continuing its discussions regarding the standard for asbestos (chrysotile) levels in the air. Since these discussions are continuing, the CNESST will advise at the appropriate time and place when the recommendations will be released.” (translation) A chilling response that sounds like it came from George Orwell’s novel 1984. Thus, after more than a year, the CNESST continues to ignore the clear scientific evidence on asbestos and continues to betray its mission to protect the health of Quebec workers and instead is playing a role of complicity with asbestos interests. No other occupational health and safety Commission in the western world professes such ignorance as to the hazardousness of chrysotile asbestos. The CNESST has a shameful history with regard to asbestos, having aided the export of Quebec asbestos to countries overseas where workers were exposed to horrendous working conditions. Why is Quebec keeping its indefensible asbestos standard? Quebec workers are being treated as second-class citizens and are receiving a level of protection against asbestos inferior to other workers across Canada. What is the reason behind the Quebec government’s refusal to act? Quebec governments are not supposed to favour second-class treatment for the citizens of Quebec. The Quebec government is in a serious conflict of interest, having a legal obligation, as co-owner of a corporate project to commercialize the asbestos wastes, to place the financial interests of the project before any other consideration. On the other hand, the government has a legal obligation to protect occupational and public health. But if the government established proper safety standards, as demanded by the Quebec government’ s own medical experts, this would undermine the financial and practical viability of the project. A recent analysis of the wastes shows that they contain from 20 to 25% chrysotile asbestos. The INSPQ and the 17 Directors of Public Health of Quebec, among others, have warned of the danger to health posed by these wastes and have pointed out that, due to the influence of the asbestos industry, Quebec’s environmental legislation on asbestos is very weak, with Quebec being the only province in Canada that specifically states in its environmental legislation that asbestos is not a hazardous substance. It would be laughable if it were not so tragic. Instead of taking seriously his duty to protect health, the Minister of Health, Dr. Gaétan Barrette, trivializes the dangers of asbestos with an almost mocking attitude, making a comparison with eating too many hamburgers. He described as “extreme” the position of the director of public health of the Thetford Mines area who recommended adoption of stricter protection measures regarding the mountains of asbestos wastes and has been subjected to intimidation and threats for doing so. The Quebec government and the Quebec Pro-Chrysotile Movement are lobbying the Canadian government to exclude the asbestos wastes from its upcoming legislation to ban the use of asbestos. . Showing enormous integrity, Quebec’s 17 Directors of Public Health and the INSPQ made formal submissions asking the Canadian government to include Quebec’s asbestos wastes in its legislation to ban the use of asbestos. The Trudeau government has indicated that it will succomb to the political pressure to exclude the wastes and ignore the advice of Quebec’s medical experts. It seems that the government of Quebec is treating commercial interests as more important than human life. In supporting the asbestos wastes project, the government is showing not only a shocking lack of transparency but also an incapacity to ensure any independent oversight to protect occupational or public health. The reason that the Liberal Party of Quebec government is refusing to change the asbestos exposure standard appears to be because, if it did so, it would render the asbestos wastes projects unfeasible. The Liberal Party of Quebec is not alone in thus betraying science and public health. While claiming to defend the rights of workers, the Parti Québécois is demonstrating a cowardly complicity and refuses to disclose its position on the asbestos exposure standard. The Coalition Avenir Québec, instead of answering the question on the exposure standard, sent a response extolling the “billions of tons of asbestos mining wastes in Quebec” that “can, thanks to technologies, be revalued and are rich in metals of economic interest (iron, chromium, cobalt, etc. ), in addition to being a source job creation.” (translation) The refusal of these political leaders to disclose their position is not what decmocracy is supposed to look like. Where is the leadership of these three political parties with regard to a toxic substance which continues to kill more workers in Quebec than any other danger? They are using a dishonest tactic to avoid their political responsibilities and to suppress the advice that health experts have given them. Québec Solidaire is the only political party that has demonstrated courage and integrity and has demanded that the government respect health experts and make the asbestos exposure standard stricter. Québec Solidaire was the first political party in Quebec to call for asbestos to be banned. In 2010 the Quebec Medical Association issued a media release in which it condemned the “wilful blindness” of the Quebec government to the dangers of asbestos. Today that “wilful blindness” continues. Everywhere in the world where the asbestos industry has pursued its interests, we have seen the corruption of science followed by immense human suffering. It seems that this tradition is continuing in Quebec with the major political leaders demonstrating a flagrant betrayal of science, democracy and public health.